Over 30 video tutorials (almost 10 hours of material) are available to help the new set up and run DEM simulations using the Newton software. Each tutorial focuses on a specific topic such as cluster creation, size distribution, CAD importing, post processing data, creating avi animations files, and much more. Newton is a general purpose Discrete Element Method (DEM) simulation package used to quickly and accurately model the three-dimensional behavior of complex material flows. A variety of constitutive models have been included to model a wide range of material properties including wet sticky cohesive material. Material degradation, surface wear, impact damage, energy dissipation, and other fundamental parameters can be easily analyzed. Click on the playlist to the left to start watching the first Newton tutorial, a general overview of the Newton software. Or click the link below to go to our YouTube channel to view all available tutorials. 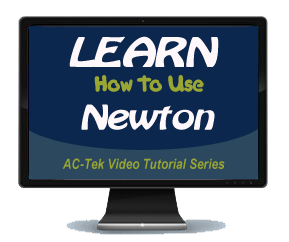 You can watch the entire Newton Tutorial series on the AC-Tek You Tube channel here. Our users have found that these tutorials are an excellent way to quickly become proficient users of the Newton software.